Mo Alie-Cox will have a tough test taking on a Mason defense that is likely to double-team him throughout tonight’s matchup in Fairfax. Conference play is here and it starts on the road for VCU, taking on what looks like an improved George Mason team that defeated the Rams in Fairfax last season and could match their 2015-16 win total of 11 with an Atlantic 10 opening win tonight. VCU will look to pick up their 11th win of the season as well while extending their winning streak to five, hopefully snapping a nine-game Mason win streak in the process. Let’s get straight to what you are all wondering: is Mason improved or have they just beaten up on a bunch of cupcakes? Well, both could potentially be true. The Patriots are off to their best start since the 2010-11 season, a season that ended in the round of 32 of the NCAA tournament. Part of that however may be thanks to a winnable schedule assembled for a rebuilding program by second-year head coach, Dave Pauslen. The Patriots have played the 51st easiest schedule in the country out of 351 teams (or 300th worst schedule, depending on which sounds better for you), playing six sub-200 ranked teams that includes one DII opponent and just one top-100 squad. The Patriots, to their credit, made easy work of most of those teams, winning by double-digits in seven of their 10 wins including all of their last five contests. One of those wins and easily their most impressive of the season came against kenpom No.105 Penn State, a 19-point Mason road win that had to turn some heads in this conference. But what has many non-biased analysts still skeptical are some close calls and losses to some bad teams. Mason fell in overtime to No.248 Mount St. Mary’s, dropped their home-opener against No.148 Towson and needed overtime to escape a two-win JMU team in Fairfax. 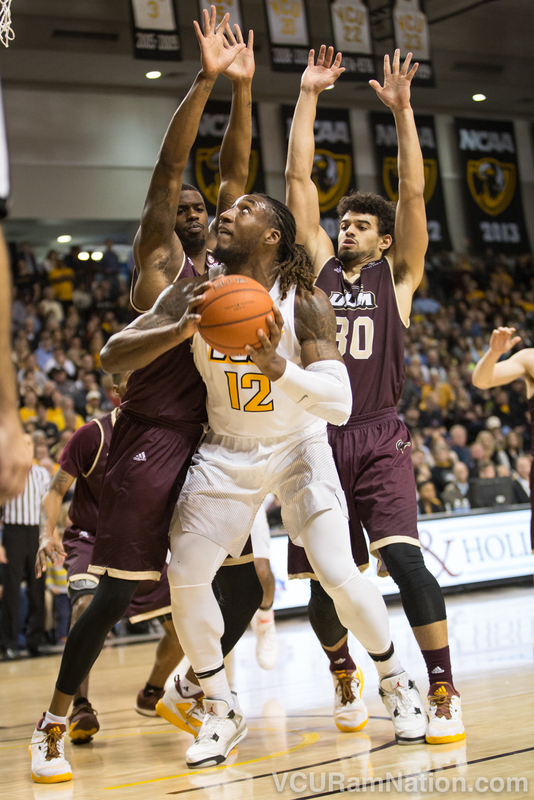 That however is not much different from a VCU team that managed to escape a sub-200 Liberty team on the road and trailed another sub-200, Louisiana Monroe, in a recent home game before coming back to win big. What is different between these two squads i their body of work against good squads. Mason has played just one top-100 team, losing to No.40 Houston by 37 points. What’s more, this past Wednesday I pulled the offensive effective field goal percentage numbers of the teams Mason has played this season and needless to say, Mason’s D has hardly been tested this season. As of Wednesday, those teams ranked 269th, n/a (DII), 243rd, 28th, 286th, 213th, 226th, 267th, 233rd, 253rd, 139th, 244th, 324th. They have played just one team that ranks within the top-200 in efficiently putting the ball in the hoop and were beaten by 37 points. VCU will be just the second team Mason as played all season with a top-100 EFG% offense and not only that, but brings the highest ranked defense Mason will have seen all season. George Mason lost two key players from last season’s namely, namely 6’11 shot-blocking/rebounding monster, Shevon Thompson. Even without Thompson the Patriots have rebounded the ball at an extremely high rate. Marquise Moore checks in at just 6’2 but leads the Atlantic 10 with 11.1 rebounds per game. He’s also the team’s leading scorer at 18.1 points per game and so far has made himself a legit A-10 POY candidate. Moore is joined in the backcourt by 5’11 sophomore Otis Livingston II who is averaging 15.2 points of his own and is shooting the leather off the ball this season (40.7% 3p%). The Patriots key paint patroller is 6’7 senior Jalen Jenkins. Jenkins has scored 10.5 points per game and is hitting just under 70% of his shots. 6’4 sophomore Jaire Grayer has scored 9.5 points per contest but has mostly ben an inefficient volume player, taking the largest percentage of the team’s shots when on the floor despite a poor 44.4% effective field goal percentage (dude has been terrible from deep, but he’ll let it fly). Two more stats before I let Mason go. Defensive rebound percentage – George Mason ranks eighth nationally in that stat, and a top-10 ranking is what you should expect their as long as Dave Paulsen is their coach. Four of Paulsen’s last six teams (three of his previous team, Bucknell) ranked in the top-two nationally in defensive rebound percentage. This is what they do. Paulsen’s squads pack the paint and collapse on everything. It’s a schematic thing that basically guarantees defensive boards and limited opportunities for their opponents. Turnover percentage defense – Another stat that has been basically automatic for Paulsen D’s is a low turnover-forcing defense. Paulsen teams don’t take chances on steals and with that simply don’t turn teams over. All six of his last six teams rank sub-300 in turnover defense, including this year’s team who ranks 338th nationally (out of 351 teams). That is a great stat for a VCU team that has struggled with turnovers this season. You are familiar with these guys by now so let me just highlight a couple of things. First, as I just mentioned, it’s all about turnovers with this team. VCU will force turnovers on defense, ranking 19th nationally in turnover percentage D, but they’ve helped negate that by turning it over a ton early themselves. Fixing that has been a huge point of emphasis for Will Wade and it appears the Rams could be trending in a positive direction. The Rams had just five turnovers in a key home win over a tough Middle Tennessee State squad. They followed that up by averaging 12.5 their next two contests, which is 0.5 turnovers over Will Wade’s team goal. Playing a low turnover% defense in Mason should help there. The other key piece for VCU is interior scoring. That’s the tried and true method for Will Wade and Co., basically taking high percentage shots and not settling for threes. Basically when VCU hits 20 or more twos, they win. When they are 17 or below, things get interesting (VCU averaged 16 made twos per game in their three losses). They’ll take on a Mason team tonight that will collapse on Mo Alie-Cox, double-teaming VCU’s senior big for every minute he’s on the floor, forcing Alie-Cox, Justin Tillman and Ahmed Hamdy to make smart passes while playing inside-out. But if VCU can find a way to get things going inside, be it with their bigs or with slashing guards, things could look good tonight. Mason has allowed their opponents just 46.6% scoring inside the arc, but again, haven’t played the toughest group of offenses. The Rams win this one if they take smart shots and defend. Last season’s road loss in Fairfax saw some of the worst shot selection I’ve seen from a VCU team. The result was a disappointing loss that made us all a little uneasy about VCU’s NCAA tournament at-large chances (how many NIT tweets did we all see that night?). Taking on such a good rebounding team puts a premium on shot selection, so VCU needs to make all their attempts count while hopefully winning the turnover margin by a large enough margin to help negate whatever rebounding advantage George Mason might have tonight. Let’s be real, this is about as big of a game as the Patriot Center as seen in a while. Two 10-3 Virginia teams, long-time foes, playing for a 1-0 start to Atlantic 10 play. Those are the types of high-energy games that can really favor a home team if they take advantage of it. Mason’s ability to hit shots early could give the Patriots the momentum needed to pick up a big conference win while proving they are very much for real. George Mason kept it simple by torching the Rams inside the arc in their last win over VCU. GMU took 47 twos to just five threes in that contest, connecting on 51.1% of their shots inside the arc that fateful evening. That’s the same game plan I roll with if I’m Mason tonight. Attack the basket, play to your strengths, then rebound, rebound, rebound. Kenpom: 73-71 VCU win with a 57% chance of a Rams victory. Game tips at 8PM at Eagle Bank Arena in Fairfax, VA.
Watch: CBS Sports Network, Official game day headquarters are Buffalo Wild Wings locations at Virginia Center and downtown on Cary Street in Shockoe Bottom.